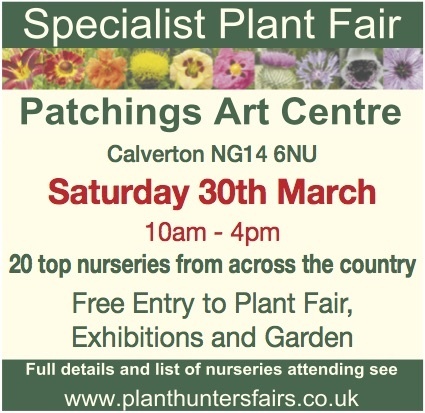 Entry to this new Plant Hunters' Fair at Patchings Art Centre is completely free and offers the opportunity to pop along and visit 22 highly respected specialist nurseries, gardening accessories and artisans from across the country at no charge to get your gardening season off to a great start. The nursery folk will be more than happy to give you the benefit of their experience in how to plant and care for the plants you buy so you can get the best from them. Patchings Art Centre has so much to offer with galleries and working artists. Take a walk around the grounds and discover a myriad of insects and wildlife as you meander along the grass paths, gardens with woodland walk, lake area with Monet Bridge all with free entry. The plant fair runs from 10am-4pm on Saturday 30th March. The event offers free entry to the Plant Fair. Free entry to galleries and gardens. Free Parking. Dogs welcome in the fair. Refreshments available.